In mid-1958, the Gibson Guitar Company tried something new to drum up sales for it's Les Paul Standard model, the latest evolution of what began as "The Log" in Lester Polfus's workshop; still utilizing the same design and construction as the "Goldtop" Standard model's mahogany neck and body with maple top (including the Patent-Applied-For "PAF" humbucking pickups invented a year prior), but now featuring a transparent cherry-red-to-yellow "Sunburst" finish on that maple top, inspired by the company's acoustic and archtop jazz models. No two guitars were alike, as the original dying process brought out varying degrees of depth from the maple wood grain unique to each instrument. Some models had rather plain tops, in comparison to the curly figured maple bookmatched tops found on some of the most valuable and desirable instruments of the era. As the original dye would fade rapidly over time when exposed to UV light, a new technique was employed in 1960, resulting in a bolder, more reddish-orange "tomato soup" look, with slightly less transparency (the neck thickness was also slimmed down a bit by then). Generally speaking, 1959 models are considered the pinnacle of the line, but all three years provided some of the most collectible, beautiful, and best-sounding electric guitars of all time. Great examples of 'Bursts from '58 (left), '59 (center), and '60 (right), showing variations in figure and color. 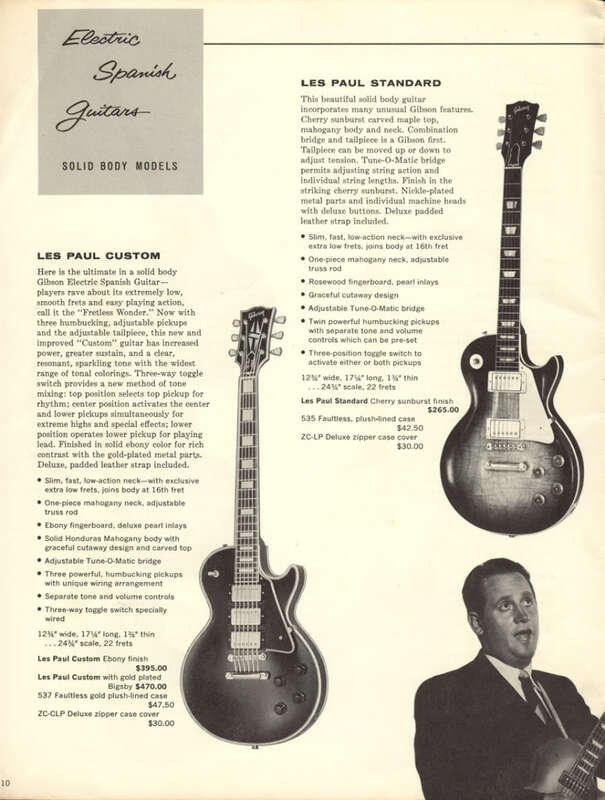 Despite all this, and rather ironically, the heavy, expensive Les Paul was considered a commercial failure at the time, and only 1,712 Sunburst Standard units were produced from 1958 to 1960 (Even Les himself preferred the tuxedo-like all-mahogany "Black Beauty" Custom model). By '61, the Les Paul guitar was redesigned by Ted McCarty of Gibson as a thinner, lighter shape, with easier access to the upper frets; we now know this model as the SG, but until 1964, it hadn't changed titles. 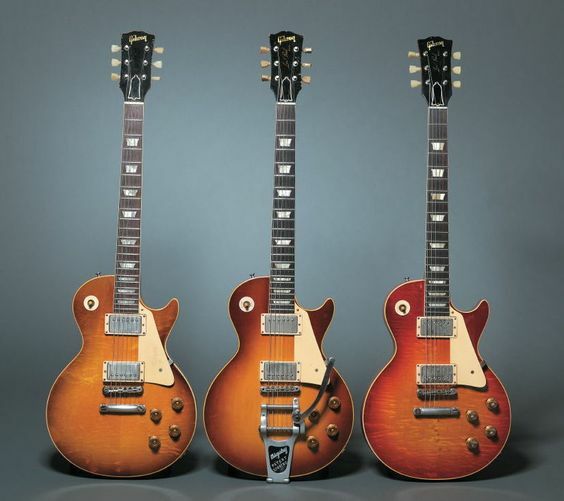 At that point, Les asked for his name to be removed from the newer design, which he never cared for, and as he was entering a state of semi-retirement and no longer retained his popularity of a decade prior, Gibson obliged. 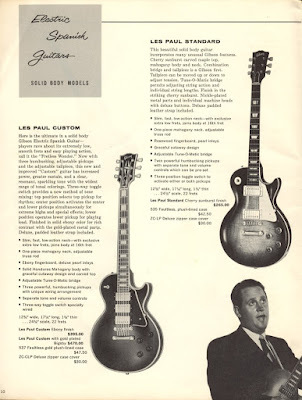 There would be no more Les Paul models in Gibson's immediate future beginning 1964. That very same year, across the pond in London, a young English guitarist named Keith Richards walked into Selmer's Music Shop with a few quid to spend before his group, The Rolling Stones, embarked on their very first tour of the U.S. He spotted a sunburst Les Paul Standard which had been retrofitted with a Bigsby vibrato, and since it was previously owned, he could afford to buy it. He played it extensively on that tour, including the Stones' debut appearance on The Ed Sullivan Show, and used it to record many of their early hits, most notably "The Last Time", "Time Is On My Side", and "Satisfaction". 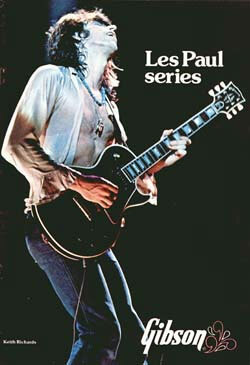 Keith owned and played a sunburst Les Paul before any of his contemporaries, including many of whom became famous for their use of the instrument: Eric Clapton, Jimmy Page, Jeff Beck, Peter Green, Paul Kossoff, Mike Bloomfield, Billy Gibbons, Joe Walsh, Duane Allman... Keef had 'em all beat to the 'Burst. That particular instrument, serial number 9-3182, turned out to be a '59 model, purchased brand new in March 1961 at Farmer's Music Store in Luton, UK, by John Bowen, guitarist of Mike Dean & the Kinsmen. Bowen had the Bigsby vibrato installed at Selmer's shop in London, where he eventually traded in the guitar for a Gretsch Country Gentleman in late '62. It waited there a year and a half before it's serendipitous Rolling Stones future. 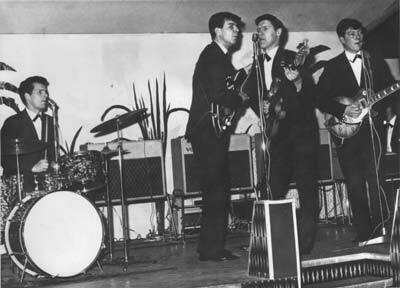 John Bowen (far right), playing that infamous '59 Les Paul circa '61-62. As Keith played the 'Burst more and more, it's popularity grew on the London blues/rock scene. Jimmy Page used Keith's new guitar on a recording session in July of '64, as he was a busy session musician in London at the time, and Keith and Mick were honing their craft as songwriters. A version of "Heart of Stone" from these sessions featuring Page and the "Keefburst" can be found on the 1975 Stones compilation album Metamorphosis, and Jimmy went on to purchase several 'Bursts of his own over the years, including a '58 and '59. Jimmy Page with Keefburst, July '64. Clapton famously used a 1960 'Burst on the John Mayall Blues Breakers with Eric Clapton recordings of early '66, known widely as the "Beano" album, and the guitar subsequently referred to as the "Beano Burst". 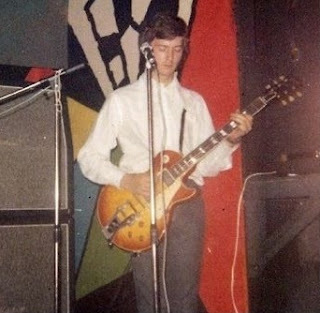 That guitar was stolen or left behind by Clapton shortly after the recording, and he is known to have borrowed at least two different 'Bursts during the early days of Cream, including one that looks suspiciously similar to Keith's. 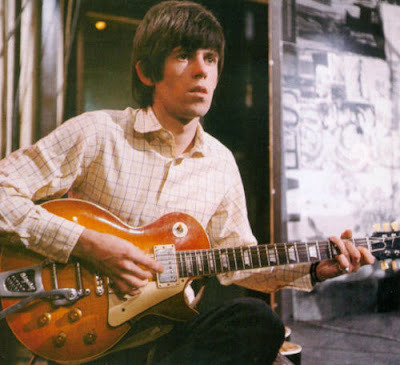 It's unconfirmed, but some experts believe it to be the same guitar, as Keith was favoring a Black Beauty by then and looking to sell his original. If true, that would mean the Keefburst may have been used on the Fresh Cream recording sessions, as well as with Cream at the Windsor Jazz & Blues Festival in July of '66. Eric Clapton, possibly with Keefburst, performing with Cream in the summer of '66. 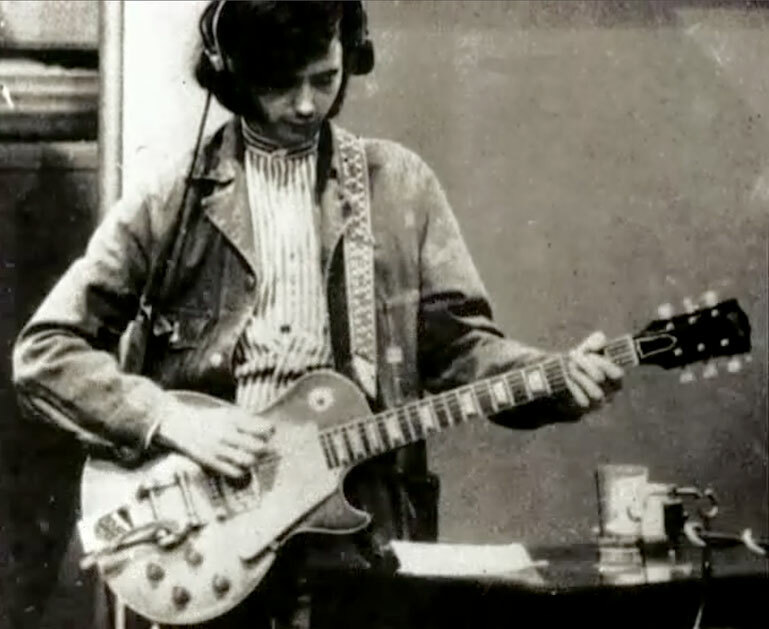 With Keith looking for a buyer, he eventually found one in the young 17-year-old blues prodigy Mick Taylor. In 1967, Taylor was invited by John Mayall to replace Peter Green in The Bluesbreakers, following in the footsteps, err, fingerprints of Clapton, and he jumped at the great opportunity, having filled in for Clapton once before with Mayall a year prior (and played the Beano Burst before it was lost). As Clapton defined the sound of the Bluesbreakers and British blues in general with his Beano/Marshall amp combination, Peter Green followed suit accordingly with his own 'Burst, a '59 with a reversed and polarity-flipped neck pickup, yielding a haunting, piercing out-of-phase tone in it's middle position, drenched in reverb, taking the blues towards a psychedelic direction and eventually forming the group Fleetwood Mac (articles have been written entirely on Greeny's '59 'Burst, which was later passed along to Gary Moore and currently owned by Kirk Hammett of Metallica, who paid over a million dollars for the instrument). Back in America, Gibson took note of the newfound popularity of it's discontinued instrument, and in 1968, reissued the Les Paul Standard and Custom models, with none other than Keith Richards as their advertised endorser. Keith was playing black Customs almost exclusively at this time, including one that his girlfriend Anita Pallenberg painted a colorful psychedelic dragon on. The SG design that initially replaced it was very popular and has stayed in production to this day, but the Les Paul became THE rock guitar of the era, thanks in no small part to Keith. 1968 also saw Jeff Beck using a '58 'Burst for his seminal and incredible solo debut Truth, and it was the same year that Billy Gibbons of ZZ Top acquired the infamous Miss Pearly Gates, a '59 model which he was recently offered five million dollars for by a Japanese collector. As the newest Bluesbreaker, Mick Taylor knew he'd need the right instrument to fit the sound and style Mayall had become known for, and the Keefburst did the trick, recording the great albums Crusade and Blues for Laurel Canyon with the instrument. 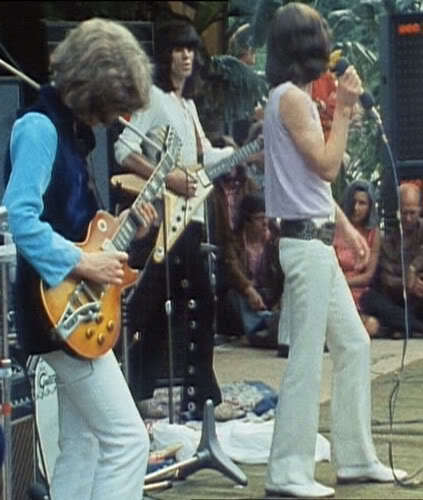 Circumstances came full circle when Taylor was asked by Mick Jagger to join some recording sessions with the Stones in June of 1969, and then in July, two days after the tragic death of Brian Jones, Taylor made his live debut with the band at London's Hyde Park in front of approximately 250,000 people in what became a tribute to the fallen founding member of the group. Mick Taylor with the Keefburst (left) at Hyde Park, July '69. Mick Taylor played the Keefburst throughout the '69 Stones world tour, even sharing it with Keith for the odd tune now and again. It's featured all over the Sticky Fingers album as well. The guitar then disappeared in '71 under mysterious circumstances; one story claims it was left in a closet at London's Olympic Studios before the Stones fled the country as tax exiles, another says it was stolen at their farewell show at London's Marquee Club, or from the Nellcote villa in France during the recording of Exile On Main St., along with a few other instruments such as Keith's Telecaster. Regardless, the Keefburst would eventually surface in the hands of Cosmo Verrico, guitarist of The Heavy Metal Kids, in the mid-'70s; he claims it was given to him by a "Stones representative" as payback for a guitar of his that was stolen. 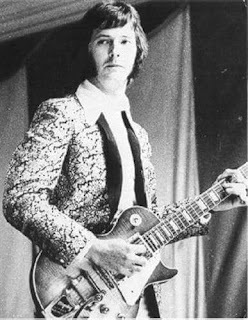 Cosmo removed the Bigsby and pickup covers (which have since been re-installed), and at some point the Kluson tuners were replaced by Grover machines, possibly by Mick Taylor. The guitar began changing hands after this, with Cosmo selling it to Bernie Marsden of Whitesnake. who turned it around in a week for $50 profit to collector Mike Jopp, who then held onto it for nearly 20 years (and much greater profit). It was bid up to $340,000 at a Christie's auction in 2004, but did not meet reserve... rumor has it that $600,000 was turned down for it privately around the same time. Most recently, it was purchased by a private collector in Europe in 2006 for a rumored $750,000. Considering the increasing value on the vintage market of such guitars over the past decade, it would easily sell for over a million now. The Keithburst, in it's aged, faded glory. So, did Keith Richards unknowingly start the 'Burst craze when he walked into Selmer's Music Shop in 1964? It's fair to say he was the first on the scene with one, and his influence is undeniable. 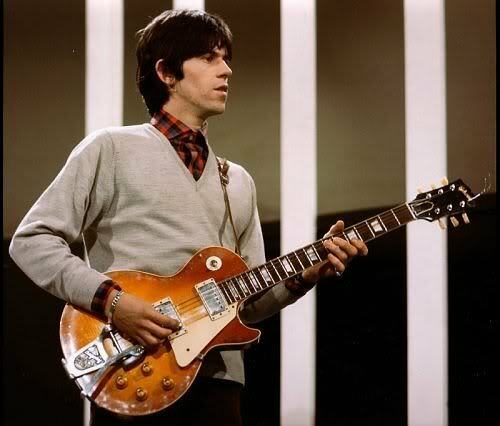 The funny thing is, according to a few first-hand accounts who've seen and played it, that the guitar is rather unremarkable compared to others of it's vintage, likely why it's changed hands so often compared to other instruments of the era, and possibly why Keith wanted to sell it in the first place. It's certainly beautiful looking, but possibly not the most resonant choice of wood, or an off day at the factory for the pickup winder (as opposed to the Greeny 'Burst, which has been described as breathtaking in all regards). It certainly has it's place in rock-and-roll history, though, and that cannot be denied. The Custom was always all mahogany in the 50´s. It did not get the maple cap untill the 1968 reissue. Furthermore the Custom had an ebony fingerboard, whereas alle the other Les Pauls had rosewood. So claiming that the Custom was utilizing the same construction as the goldtop and the sunburst, is not correct. In my experience a 50´s Custom is significantly different from a Goldtop or a Burst. Ultra-violet dying proces ???. Nope, they were dyed using analine dyes, which react to ultra-violet rays, and thus to varying degrees fade, often to the degree that the guitars become "unbursts" (Apparently the ultra-violet rays remove the s in sunburst). "Some models had rather plain one piece tops", really? I have NEVER heard of an original 50´s Les Paul with a one piece top. I´ve seen pictures of some, that look like one piece, but there always is a seam, although it can be difficult to see. Noted, thanks for the corrections! The Keefburst is now in Sweden owned by collector and guitarist from Cardigans. Mr Peter S.
Great synopsis, would love to see John Sebastian get a mention for his early use of one.